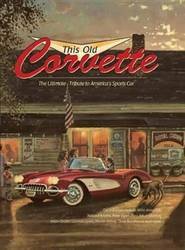 This Old Corvette is an anthology of excellent stories, artwork, and photography on this classic sports car. Stories by well-known historians and Corvette and automotive figures (such as Michael Antonick, Noland Adams, Peter Egan, Zora Arkus-Duntov, Allan Girdler, and Martin Milner) provide a broad overview of this groundbreaking automobile that's more than a mode of transportation. For some, the Corvette is an expression of the art and beauty of the classic muscle car.The collection of stories conveys the breadth of the history of the car, as well as its prominence in pop culture and how it influenced the dreams of generations of Americans.The stories flow seamlessly with the artwork (from such artists as Kent Bash and Dave Barnhouse), which includes stylish period ads and brochures, race posters, funky old car magazine covers, and classic Corvette movie, TV, and music memorabilia. This Old Corvette also includes a Corvette timeline which takes readers through the entire history of the Corvette and it's history in American culture. An American classic, the Corvette has made a name for itself worldwide. This collection of Corvette stories is perfect for any classic car buff in your life, from the inclusive timeline to the stories told by famous automotive figures.